White Knight’s Best of State® medals and statue from 2011 and 2012. White Knight has won awards for innovation, manufacturing, employee programs, and community outreach programs. 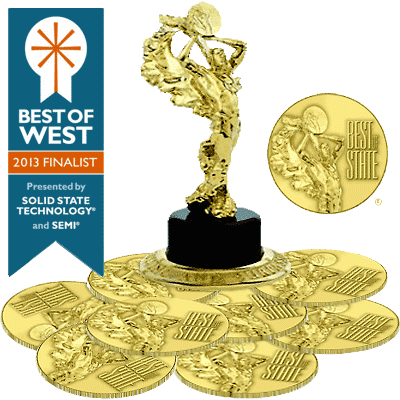 In 2013, Solid State Technology and SEMI selected White Knight’s Closed-Loop Control System as a 2013 Best of West Award finalist. In 2012 and 2011, White Knight won nine Best of State® medals and a division trophy for achievements in Production & Manufacturing, Science & Technology, and Community Development categories. No other company in Utah received as many medals in either year. White Knight was awarded the Best of State® statue in 2011 for most outstanding medal winner in the Production & Manufacturing division. In this division, White Knight won medals for our work with Machinery, Chemicals & Related Products, and Rubber & Plastics.